Everyone has had toys and everyone has wondered what the same toys do when we are not around. "Toy Story" answers that for us in a whimsical and beautiful way! John Lasseter's fantasy captures the viewer, young and old alike, from the first moment when the film starts to roll and we are introduced to the little boy Andy, who is quickly growing up. Woody, the adorable and bumbling cowboy who is the co-main character of the movie is just a delight. Voiced by the ever amazing Tom Hanks, Woody is the straight man to the other characters antics. The worrier, the leader, the sometimes goofball, Woody's playful and childlike qualities draw in the viewer immediately. Buzz Lightyear, the fantastic space hero, is equally as entertaining. Tim Allen makes the character believable, funny and endearing. You root for him to return to his beloved space and cheer on the friendship that comes to life between himself and Woody. Classic toys that all have seen or owned are woven into this delightful tale too such as Mr. Potato Head, played by the hilariously serious Don Rickles. The Slinky Dog made up of a real slinky and the Piggy Bank and plastic toy soldiers are all wonderful and so much fun! The marching of the plastic soldiers on their little green stands is worth watching the film alone! The story line and plot is stellar in that it connects and captivates the young and young at heart. Comedic gestures, comments, and simple animated looks onscreen can send the viewer into gales of laughter. Similarly, tender moments between the characters can evoke genuine feelings of sympathy and rousing cheers can go up when they succeed in their mission. 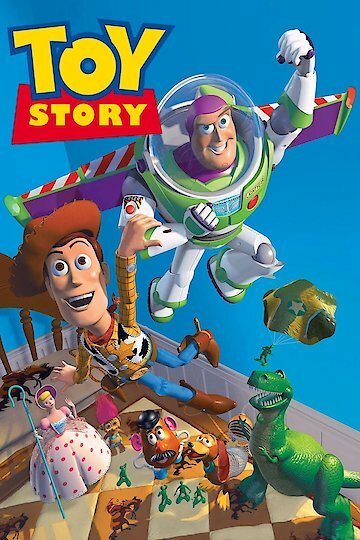 The music of "Toy Story" scored and performed by Randy Newman is another plus in this fine film. The bouncy tunes when fun things are happening are balanced by the melancholy when times are tough. Mr. Newman's music compliments the fine directing and acting, never overstates it. "Toy Story" is a classic movie for any age and any time. It will never go out of style as the plot line of friendship and everything it can overcome will always be a human need. Watch it again and again with children, grandchildren or just on your own. It might be billed as a children's film but all ages will remember it fondly. Toy Story is currently available to watch and stream, buy on demand at Amazon, Vudu, FandangoNow, iTunes, YouTube VOD online. The veteran comic made it fashionable to be mean. 'Toy Story 4' Is Happening! Disney CEO Bob Iger confirmed that a sequel to the trilogy is in the works. See, the movie is actually about existential angst and the fear that you will become useless and obsolete. Yay! What if Sid isn't the sadistic little boy we all think he is?